Franchise moved to Charlotte, N.C., playing the rest of season as the Charlotte Stars, then the Charlotte Hornets. • In 1983, the team franchise was originally the Boston Bulldogs, renamed the Boston Bulls. 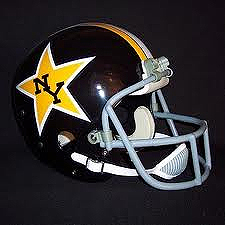 • Unable to find a Boston stadium to play in, they merge with an unnamed New York franchise, creating the New York Stars for the WFL's initial season in 1974..
• Yankee Stadium was being reconstructed and would not be available to play in until 1976. • Roosevelt Stadium in Jersey City was in bad condition and in New Jersey. • Baker Field, the oldest temporary wooden stadium in the country, was considered for their home field. It was in Manhattan and had 32,000 capacity. But negotiations with Columbia University broke down. • Downing Stadium, on Randall's Island, capacity 22,000, also old, decrepit and out of the way (accessible only via, and situated under, the Triborough Bridge), was chosen, by default, as the Stars' home field. • The New York Stars #1 draft choice was Joe Namath. • The 9/25 game, originally scheduled for Yom Kipper on 9/24, was moved to the following night. • The 9/24 game was dubbed the Bankrupt Bowl because both teams went bankrupt preceding the game. • The franchise was forfeited and resold and moved to Charlotte, North Carolina. The next week's game was played as the Charlotte Stars, and then the rest of the 1974 season and the 1975 season, as the Charlotte Hornets. • The New York Stars were 8-5-0 and ½ game behind in 2nd place, when the team was transferred south.